Let's take an updated look at the NCAA tournament odds we updated this past Saturday. Not much has changed here. The Buckeyes remain the clear favorites in this region, although the winner of the Syracuse/Wisconsin game awaits. The numbers give the Buckeyes the third-best chance to win it all; it's probably even better than that given that UNC has the second-best chance, but that was before Kendall Marshall fractured his wrist. Those take several weeks to heal, so while he might be back over the weekend he won't be at 100% by any stretch. Look for a Syracuse/Ohio State Elite Eight, and an Ohio State Final Four. The raw numbers here point to a Kansas Final Four, but there's an intriguing possibility: an North Carolina State Final Four. Kansas has been anything but invincible, and the Wolfpack took UNC down to the wire in the ACC tournament two weeks ago. If NC State can get past Kansas, there's a good chance they could find themselves in the Final Four. This bracket is [still] Kentucky's to lose. Indiana and Baylor are good teams, but provided the Wildcats can keep doing what they've been doing they're unlikely to be seriously challenged until the Final Four. As I said in the round of 32 summary, Michigan State would need to get past St. Louis to reclaim the mantle of "favorite." Even now, though, Florida has a good chance of making it to the Final Four. Michigan State has been far from dominant, and looks to be the second top seed that's likely to slip up. "By the numbers" Final Four projection: Kentucky, UNC, Ohio State, Michigan State. "Fun" Final Four projection: Kentucky, North Carolina State, Ohio State, Florida. Let's take an updated look at the NCAA tournament odds we originally posted on Wednesday. [Note: We're a little late with this post, as Syracuse shook off their issues from yesterday and managed to defeat Kansas State.] The problem is they still have the most difficult road left, with likely matchups against Wisconsin and Ohio State. The Buckeyes are the clear favorites here, with 3.44 expected wins (EWs) in total (i.e., another 2-3 games), compared to the Orangemen's 2.35 [Note: another 1.70 EWs now.] Wisconsin remains just as likely to make it to the Elite Eight, with 2.19 EWs. ACC Champions Florida State eeked out a win yesterday, but if they can make it past Gonzaga they've got a showdown with the Buckeyes. All signs point to an Ohio State Final Four. This one remains a two-horse race, with UNC slight favorites over Kansas: 3.24 EWs versus 3.04. With 4-seed Michigan having been dispatched by Ohio, South Florida looks ready to make it to the Sweet Sixteen. This bracket is Kentucky's to lose. With half of the favorites losing in the round of 64, including a stunning 15-over-2 upset of Duke by Lehigh, only #8 Iowa State, #4 Indiana, and #3 Baylor stand between the Wildcats and the Final Four. With 3.91 EWs in this tournament, Kentucky is the clear favorite. And finally the west, where the team best positioned to make it far is ... 7-seed Florida? Thanks to #15 Norfolk State taking down #2 Missouri, the Gators have to make it through #15 Norfolk State, #3 Marquette, and #1 Michigan State. If the Spartans can get past Saint Louis, though, they'll swing back to the top as the favorite. With the football season over we're going to take a quick detour into the NCAA tournament and our hobby of using treemaps to visualize projected performance. This year we'll be using Nate Silver's tournament projections as the basis for our charts. Below we provide a region-by-region breakdown of the expected number of games that each team will win. Even though there's been a lot of talk about how great Syracuse is, the numbers paint a slightly different picture here. Ohio State, Wisconsin, Michigan State, Indiana, and even Michigan and Purdue took turns beating each other up this year. Usually there's talk of how fierce the Big East is, but this year you could use the same narrative for the Big 10. Silver projects that Ohio State will win 3.31 games, while the top-seeded Orangemen will be lucky to win more games (2.27) than four-seed Wisconsin (1.86). Expect a brutal Sweet Sixteen matchup, with Ohio State waiting in the wings. The Midwest is much more of a two-horse bracket, with the Tar Heels and the Jayhawks the two clear favorites. In fact Carolina's expected number of wins (3.07) is only a shade ahead of Kansas' (2.93), while being a clear head-and-shoulders above Michigan (1.35). Meanwhile, 6-seed San Diego State will be lucky to get out of the first round, with a total expected number of wins barely cracking "mediocre" (0.56). The Aztecs may have gone 26-7, but it wasn't enough to impress the computers. Meanwhile major conference mid-pack teams like Purdue and North Carolina State look ready to advance to the round of 32 (0.91 and 0.90 expected wins, respectively). On the 20th anniversary of "The Shot", the selection committee was clearly trying to set up a rematch between Kentucky and Duke. The problem is that this bracket really is Kentucky and the 15 dwarves. The Wildcats are clear favorites (3.86 expected wins) ahead of Duke (2.34) and Baylor (1.75). In fact their biggest challenge is likely to come in the Sweet Sixteen in the form of the Wichita State Shockers (1.36 EWs), a team that at least one computer rates as superior to Duke. Note to selection committee: next time put Duke as a 4-seed against Kentucky; this will nearly double the odds that they'll meet. And finally, the west. This is the bracket with the highest degree of parity: two-seed Missouri is the favorite with 2.55 EWs, followed by #1 Michigan State (2.19), #3 Marquette (1.69), #4 Louisville (1.46), #5 New Mexico (1.43), and #8 Memphis (1.30). The Tigers actually have the best odds of any 8-seed to reach the Sweet Sixteen, and are the fifth-most-likely team to disrupt the chalk in that round behind [S5] Wichita State, [W5] New Mexico, [E5] Vandy, and [E6] Cincy. Keep checking as the tournament progresses. We'll be updating these graphs and merging them as the games are played. Update: For anyone who's heard all those statistics about how much productivity will be lost during the tournament and how difficult it is to get a perfect bracket, here's all the data (complete with attempts at citations) in one convenient yet monster chart from BusinessDegree.net. Hello, Sloan Sports Analytics attendees! This is the second year I'll be attending Sloan, and the first year my co-author will be there. We're looking forward to the talks, the hallway chatter, and watching Mark Cuban debate how much he wants to say versus how much he doesn't want to make yet another donation to David Stern. For those of you who have never visited the blog before: welcome. We're a pair of Silicon Valley software engineers who moonlight as college football stats analysts, and occasionally we're not completely wrong. I'm Justin, the founder of the blog and curator of the Tempo-Free Gridiron (TFG) ranking and prediction system. A year into the blog, I managed to rope Eddie, a co-worker and Arkansas Razorback fanatic, into creating his own competing system; the result was the Regression-Based Analysis (RBA) algorithm. To get a feel for what we do here, we invite you to take a look at some of the posts describing tempo-free statistics in general (courtesy of Ken Pomeroy), the motivation behind this particular blog, and a peek under the hood of the TFG system (and a recent update). We also have info about the RBA model (along with an update and yet another update). We'd particularly like to direct your attention to our most recent post, Deep Thoughts for Dorks, an examination of how the stats community as a whole approaches team evaluation and rankings in college football. It was inspired in part by "Sports for Dorks", a collection of essays and research compiled by Mike Leach, current Washington State head coach, former Texas Tech head coach, and former TFG "Ask an Expert" expert. [new for 2012 - 2013] live in-game win probabilities, posted to the blog and our Twitter feed. If you have any questions or feedback for us, don't hesitate to email us at our tempo-free-gridiron.com addresses (justin@ or eddie@), leave a comment here, or hit us up on Twitter. Deep Thoughts for Dorks: What are we Doing Here? I recently finished reading "Sports for Dorks", the Mike Leach-compiled collection of essays, research, and analysis of issues surrounding college football. Two chapters were of particular interest to me: "The Missing Ingredient" -- an attempt to come up with a better computer model for the BCS -- and "The No-Huddle Offense" -- an analysis of teams that use the no-huddle offense and whether or not it's effective. I enjoyed both chapters, but I feel there was something at the heart of both chapters that made it difficult for me to agree with the analysis they put forth. They were both symptoms of a larger issue that I feel permeates most analysis of college football. This post will take a quick look at these two chapters, discuss where I feel they went astray, and describe a thought experiment on how we should be going about identifying good teams. Calling all Geeks! Join Us! The Tempo-Free Gridiron is looking for more geeks to expand our ranks. Have you ever thought about coming up with your own ranking and prediction system, but thought it would be too much work? Don't know where to get the data? Don't want to get a blog or domain name set up? Worried about the time it would take to create enough content to make it worthwhile? a full suite of Perl-based tools to slice, dice, and analyze your data. Email us at justin@tempo-free-gridiron.com or eddie@tempo-free-gridiron.com. With the 2011 - 2012 season well in the books, let's take a moment to look back at the year. As we look back at this season, though, we'll revisit some of the highs and lows through the lens of our various trivia posts. In a previous trivia post we attempted to define and measure parity in a league. The definition we settled upon wasn't so much "parity" as it was "disparity": the standard deviation of the expected winning percentages (EWP) of all teams in FBS. The larger this value, the more variance there is between the EWPs, and the greater the spread between the teams; the smaller this value, the more tightly clustered teams are aroudn 0.500. So with another year in the books, let's examine the state of (dis)parity in college football. This past year actually set a new low in the overall disparity of talent across FBS (0.020547) surpassing the previous low of 0.020669 in the 2007-2008 season; if you'll recall, that year was a bit of a mess for top teams. 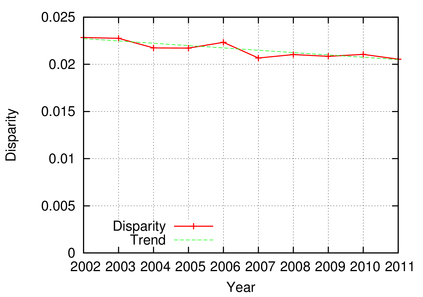 Thus continues the downward trend in disparity (i.e., a sign of ever-increasing parity in FBS). Realistically what this means is that it will be more difficult to run the table, less likely to see two undefeated teams emerge for a clear-cut title game, and more BCS debates as the overall talent level becomes more evenly distributed instead of hoarded by several top teams. Earlier this year we examined the five biggest post-September upsets since 2003. The bar to get into that club was defeating a 94.4% favorite; in other words, if you had a 1-in-17.8 shot of winning and still pulled it off, you were in. How did this year fare? Southern Mississippi Golden Eagles (9-1, 5-1 C-USA) at UAB Blazers (2-8, 2-5 C-USA); November 17, 2011. It wasn't quite 1-in-17.8, but 1-in-13 is still a pretty steep hill to climb. (47) Southern Miss was on a roll, having won eight straight after a 26-20 setback on the road against Marshall. (114) UAB's two wins had come by a combined eight points, but otherwise had been outscored 95-13 by the two ranked opponents they had played (Houston and Florida). The game started as expected, with Southern Miss going up 14-0 before three minutes of game clock has passed. From there, however, fortunes changed. The next seven drives for Southern Miss -- lasting until the 4th quarter -- were an interception, a fumble, a TD, a punt, the end of the half, a FG, and a FG miss. Thirty-nine seconds into the 4th quarter, UAB rumbled into the end zone to cap off a 31-10 run to put them up by a touchdown. Southern Miss struck quickly, tying it up at 31 with ten minutes remaining. UAB methodically picked their way downfield, burning over seven minutes of clock before getting the go-ahead field goal. USM attempted a desperation five-lateral play as time expired, but only made it to the UAB 40 before getting pushed out of bounds. USM went in as a three-touchdown favorite, and left as 3-point losers. After the jump we'll examine the most improbable winning streaks as well as the biggest swings in team strength, including ugly swandives and beautiful ascents.